Funds to build both this fountain and the bandshell on the eastern edge of the park were a bequest from Naomi Davenport, who died in 1924 at age 82. She was one of seven children born to George L. Davenport, son of Col. George Davenport, and his wife Sarah, and was the last surviving heir of her uncle, Bailey Davenport, who had no children. Miss Davenport specified that the bandshell was to be named in memory of her brother, Ebenezer, and the fountain for her sister, Catherine. Naomi also provided an endowment to support free public concerts at the bandshell. Although Naomi left all of her $200,000 estate to several charitable and civic uses, successful challenges to her will by nieces and nephews and shrinkage of real estate values reduced the park bequest to about half its original amount of $20,000. As a result, funds were insufficient to build the memorials immediately. 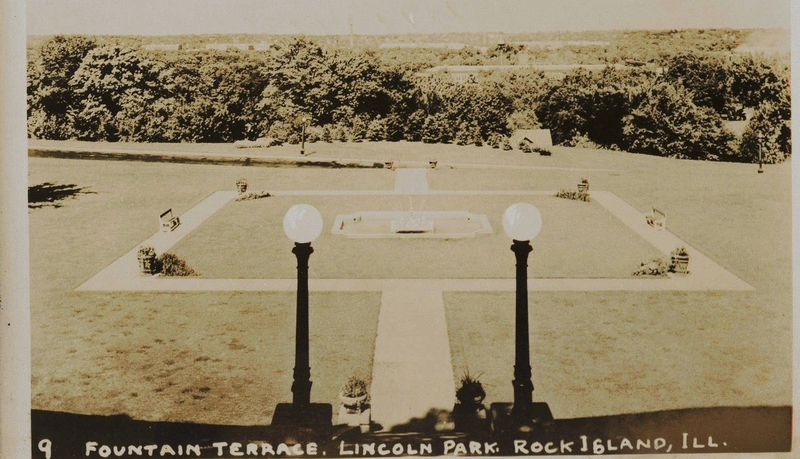 Not until 1928 did the Park Board retain Davenport landscape architect Russell L. McKown to develop an overall plan for the mostly unimproved park, to include site selections for the two Davenport memorials as well as for the Denkmann Memorial Pool. McKown, a Davenport native, had graduated from the University of Illinois in 1917. After serving in the First World War, he maintained his office in Davenport’s Kahl Building until the early 1930s, when he became a supervising landscape architect at Mt. Ranier Park. Later he moved to Yosemite National Park where he was chief landscape architect for several years until being recalled for military duty in 1942. Although no copies of McKown’s plans can be found, he described them in detail. Some of his intended features are not clearly located to the modern reader. He expected the park development to take fifteen years, with the first stage being the addition of up to 10 feet of fill over the entire lower (north) area to accommodate playground equipment and horseshoe, croquet and tennis courts. That resulted in a public outcry in 1930 when the park board decided to cut down some of Lincoln’s century-old oaks so their hilltop on the east side of 38th Street near 9th Avenue could be leveled to provide the needed fill. McKown had suggested that the source of fill would be the rough grading for an outdoor theatre. Other McKown plans included a rock and water garden in a ravine, with “three large pools connected by an overflow rill.” The pool edges would form the “very naturalistic” rock garden using “considerable boulders and ledge rock.” This feature may have been started, as the Argus reported in 1941 that two MORE lakes in the ravine west of the bandshell might be created. This implies that at least one lake or lagoon was present. The well-financed Denkmann Memorial Poolhouse was completed in 1930 but it took four more years to build the Davenport memorials. With federal employment programs for the jobless in high gear, 1934 saw not only the building of the fountain and bandshell, but also the completion of “Legion Point” plateau, complete with flag and cannons, on the west side of the park. This may have been the site of the earlier oak removal. A sidewalk from the bandshell to the pool was built and the driveway through the park was lengthened. A year later, it would be named Jackson Drive, in honor of William Jackson, known as the father of Rock Island Parks. 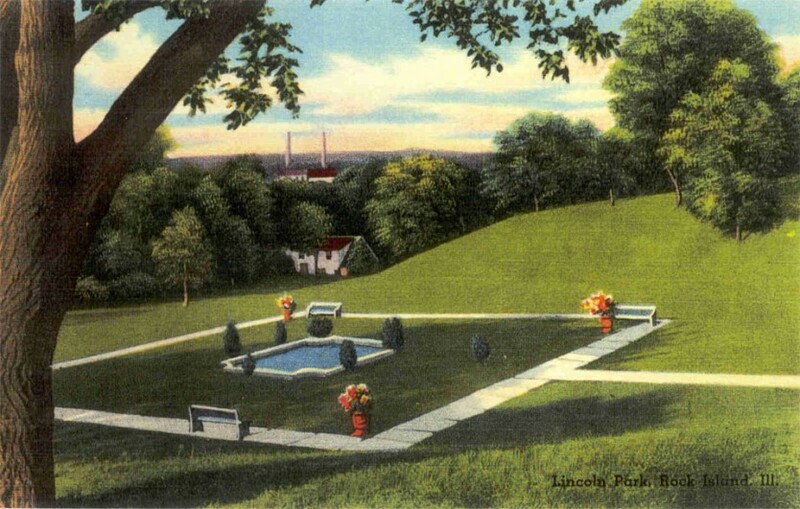 At the north end of the park, ravines were leveled and drained – and the Davenport fountain was installed on the flat area or “terrace” in the amphitheatre. The fountain, as shown on the postcards, has a cherubic boy astride a dolphin at each corner with water arching from the mouths of both into a square pool with reverse curves at its corners. The pool is framed by an even larger square sidewalk ornamented with urns and plantings at each corner and with benches along the sides. 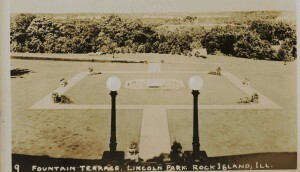 The other terrace postcard shows globe-shaped lights atop cast iron standards at the foot of the stairs that lead to the fountain from the south while another sidewalk extends north to Jackson Drive below. Where are the fountain and pool today? Filled with soil and plantings we surmised. Surprisingly, that is not the case. Not only are both the fountain and pool completely missing, but the orientation of the surrounding sidewalk has been twisted so that the corners, rather than the sides, point to the north and south. This change has happened in the last fifty years, for as late as 1960 maps show the pool and sidewalk on the postcard still present. 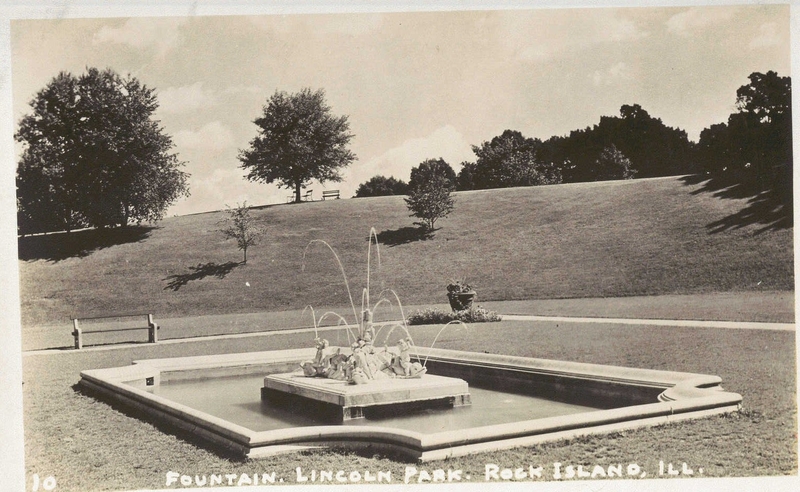 The fountain may have been removed from the pool earlier, as an undated color postcard in the Augustana College Special Collections shows the pool and sidewalk, complete with urns and benches, but missing the fountain. There is a resurgence of popularity of fountains, both new and restored, in public spaces. The simple sound of falling water summons all to sit and enjoy. Will the time come when once again Rock Island’s parks can celebrate fountains and the music of falling water?